Try something sweet in your salad. A little honey in your salad adds a touch of goumet into your cuisine. 1 medium sized beetroot, peeled and grated if raw, or cooked and cut into slices. 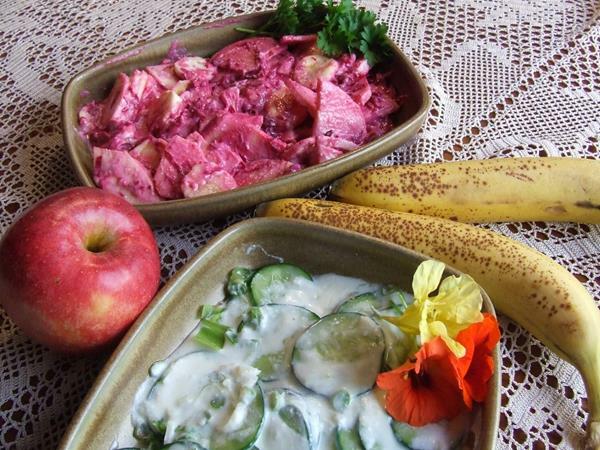 Place the bananas, mushrooms, apple, beetroot and raisins in a salad bowl. Gently blend remaining ingredients in a separate bowl. Pour the dressing over the salad mix and gently fold all ingredients together before serving. This recipe is best made just a short time before serving. *If you want to know more about kefir and how to purchase the grains, you can contact me. Mix well together and add to the salad when it is ready to be served. Peel pumpkin and cut into chunks about 1.5 cm and put in a lined baking tray. Sprinkle thinly sliced garlic and spices over the pumpkin chunks. Drizzle over honey and oil. Bake until browned and tender. Turn vegs over after 20 minutes or so. 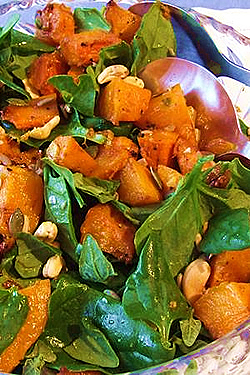 Add cooled pumpkin to baby spinach with sunflower and pumpkin seeds and cashew nuts. Add dressing to the salad and gently mix through. The dressing should be added immediately prior to serving. Here are a couple of ideas for using these wonderful summer veges and fruits and freshly harvested honey! Place the cucumbers and spring onions in a shallow dish. Combine remaining ingredients well in a separate bowl, and pour over the cucumber and spring onion. Gently mix together. 1 med sized beetroot, peeled and grated if raw, or cooked and cut into slices. * If you want to know more about kefir and how to purchase the grains, you can contact us. Place the bananas, apple, beetroot and raisins in a salad bowl.